Full Frame is a single column, full-width theme for showcasing your beautiful images, galleries, videos from edge to edge. Full Frame is responsive and adapts to different screen sizes so that your website will work (and be optimized for) iPhones, iPads, Android and other mobile devices. Full Frame removes unnecessary clutter and puts the spotlight on your content. Check out the live theme demo to see Full Frame in action. The Text Options feature allows you to alter the positioning of the text that overlays your images on the homepage and archive pages. This gives you maximum creative control over the presentation of your posts. For example, if the subject of the featured image is left aligned, you might want the text to overlay the image on the right. 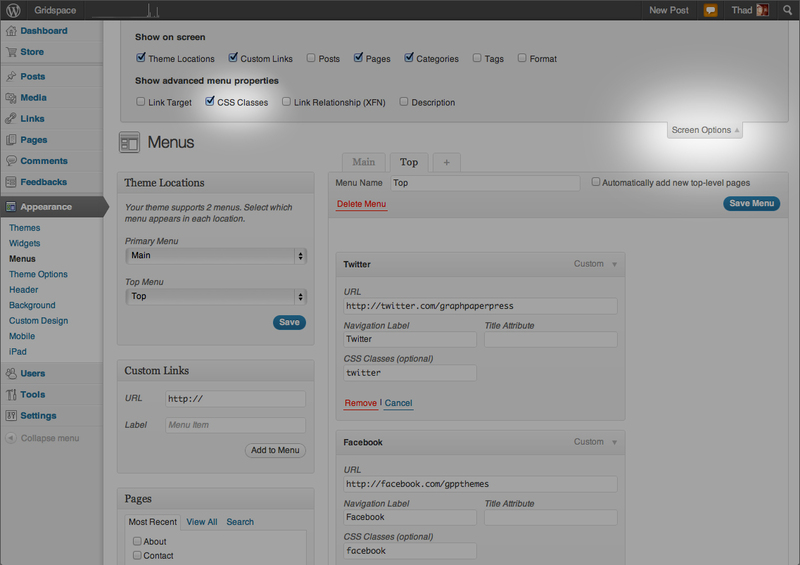 You can choose from Default, Left, Center, Right or Full Width alignment options. The Text Options feature is located in the right column underneath the Featured Image metabox. Full Frame supports six post formats. Each post format further alters the way the post is displayed so you can present images, galleries, videos and quotes in powerful, unique ways. The design of the standard post format shows the post title, date, excerpt and featured image. The Text Options feature (see above) allows you to further adjust the positioning of the text that overlays the featured image. Sweet, eh? The image post format shows the post title and date. It doesn’t show the excerpt. You can see in the screenshot above why Text Options are so useful: An image with a right aligned subject would call for left-align text. Like the image post format, the gallery post format shows the post title and the date, but not the excerpt. The example above shows a gallery inserted using the Tiled Gallery » option. Like the image and gallery post format options, the video post format shows the post title and date but not the excerpt. The first embeded video is shown as the main content, with the featured image set as the post background image on the home and archive pages. The aside post format shows the post excerpt and date. The title is not shown. The example above uses the Text Options to float the text box to the right so that it balances the post layout and doesn’t interfere with the image content. The quote post format shows the content of the post in a blockquote-style design. You can further alter the layout and design of posts assigned this format by using the text options feature. Use either the arrow keys on your keyboard or the arrow icons at the top right of the theme to navigate up and down between posts appearing on the home and archive pages. Nifty, eh? Full Frame supports custom headers, too! If you add a header image, the site description will be shown on top of the header image. Use the site description to introduce your site to your visitors. Full Frame supports custom backgrounds. If you don’t set a featured image for each post, the custom background will show directly behind each post. This gives you creative control when your posts and pages don’t have featured images. Full Frame integrates nicely into the theme customizer and includes two additional options: Logo upload and an option use your custom header image on all posts and pages. Full Frame has three widgetized areas: Footer Left, Footer Center, Footer Right. Add widgets to all, some, or none of the widgetized areas to customize the layout. Full Frame supports the following social icons: Twitter, Facebook, WordPress, Google Plus, LinkedIn, Pinterest, Flickr, Vimeo, YouTube and Tumblr. Under the “Show Advanced Menu Options” section, make sure CSS Classes is checked. This will add a new input field called “CSS Classes” for each menu item below. Toggle open the Facebook link that you added above. In the CSS Classes input field, add “facebook” as the css class. 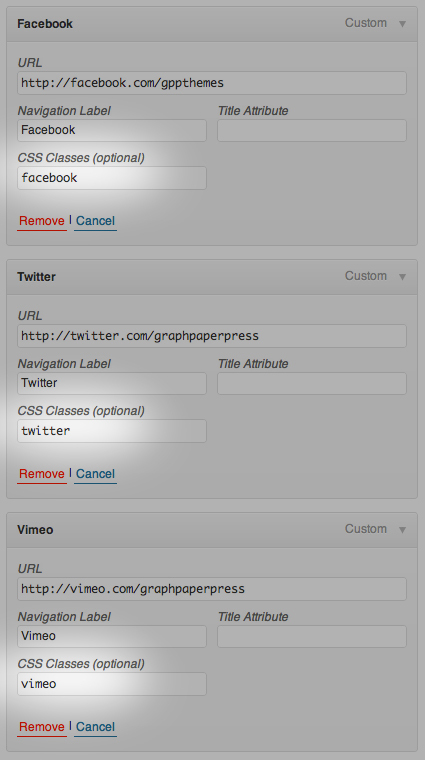 Repeat this for Twitter (add “twitter”) and Vimeo (add “vimeo”) menu links. See this screenshot of a correctly filled out menu for showing Facebook, Twitter and Vimeo icons.